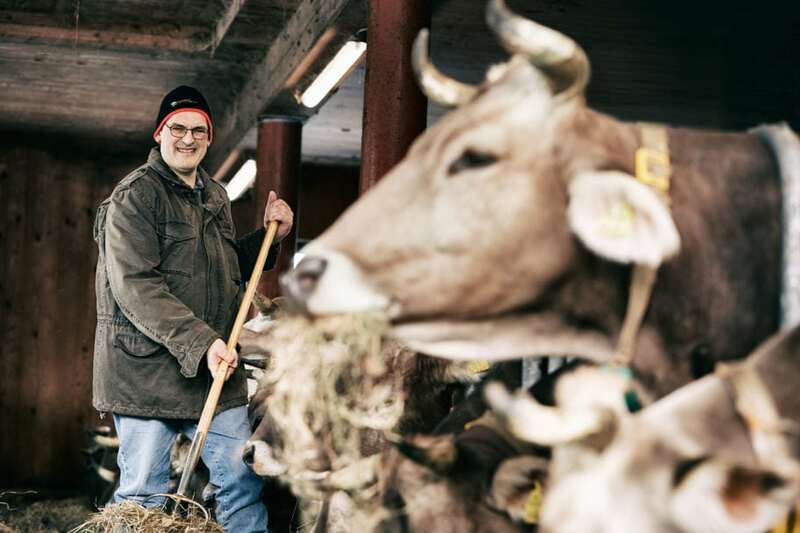 Ilga and Bruno Metzler run an organic dairy farm in Alberschwende with 17 cows and calves. 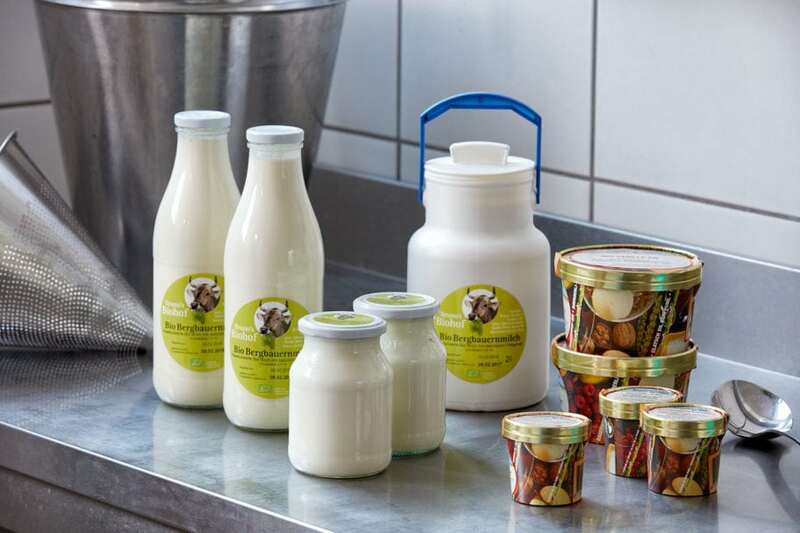 Bruno personally brings the organic bottled milk, yoghurt and ice cream to the homes of each customer. The view from the farm over the Rheintal valley and Lake Constance is remarkable. So too is the daily journey to school for the farm’s nine children who rely on a material ropeway. You may find yourself musing about the kinds of objects that have been built in such a landscape: wayside shrines, fences, huts, stables, barns, poles and supports on which cables hang. You may not know exactly what they’re used for. Take, for example, the pair of cables leading downhill to Alberschwende via supports from the district of Greban. It’s not a power line and it’s not a new ski lift either. But at dawn, the cables start to vibrate. Up at the edge of the mountain, a sky-blue box suddenly appears. Kids are crouching inside. Lots of kids, and more: handicraft cases, school bags and gym bags. Amazingly, one of the kids is quickly finishing up homework inside. Rain or shine, wind or snow, the trip takes a quarter of an hour. Once in the village below, the vehicle glides between two houses into an inconspicuous little wooden house. The Metzler’s used to operate a milk vending machine at this location, but these days such an operation is only profitable for a population of 20,000 or more. The children climb out of their crate and put newspapers, parcels and groceries inside. Then they go to school. Above, their parents, Ilga and Bruno Metzler, watch what happens below. When everything is in place, they have to get back to work as soon as possible. Milking takes place twice a day and the milk runs directly into a pasteurizer and from there into one-litre bottles. Ilga washes out the empty ones first, then labels the full ones and places them in baskets. Bruno carries the baskets into his refrigerated truck and sets off on a long journey. Each week, he spends forty to fifty hours in the Rheintal valley. This is all in addition to his other work and he often gets home only before midnight. Nobody can pay for that. Nevertheless, direct marketing is the only chance for farmers to make ends meet. Bruno mainly supplies private individuals and retirement homes. Customers appreciate the fact that his organic milk comes from a single stable and is delivered in glass bottles. For so much quality they are willing to spend one Euro and sixty cents. Bruno takes the empty bottles with him again. He must do his utmost to attract young customers, i.e. families with children who consume more milk than older people. Since he began producing six types of high-quality organic ice cream, he has succeeded in doing just so. The Metzler family dreams of being energy independent and they have nearly achieved their goal. More than twenty years ago, Bruno began to implement his vision thanks to a woodchip heating from the wood in his own forest and a large photovoltaic system. The electricity generated is still completely fed into the Vorarlberg power plant grid and is sourced from there by the Metzlers when they need it. And they need a lot: The energy expenditure for the nine children, the animals and the large household (the grandfather also lives on the farm) is enormous. The two washing machines and dryers alone run several times a day. By the end of the year, a saltwater battery is to be added to the photovoltaic system. The family will then be able to produce ninety percent of the electricity it needs itself. But Bruno would prefer to have a windmill. The space for it would be available and there are no neighbours. Bruno’s wife supports him in all his plans. Ilga grew up on a farm in Egg-Grossdorf, Bruno in Schwarzenberg. In the 1920s, Bruno’s grandfather bought the present-day farm. For a long time, the property was only used as a mid-elevation pasture. That is until the Metzlers moved in 1984. Every day they arrived from Schwarzenberg via the Lorena Pass to Alberschwende, along an ancient transit route steeped in legend. People during the Stone Age already followed this path when they wanted to cross Lake Constance and the Alps from the south of Germany to Northern Italy to exchange amber for mussels. In the 12th century, three siblings worked their way from Alberschwende via Schwarzenberg to Andelsbuch. Today, there are even boards dedicated to the fabled path that have been erected near the farm. The siblings’ names were Merbod, Diedo and Ilga, just like Bruno’s wife. I’m confident that these three holy figures of the Bregenzerwald would be amazed at the children riding down in the material ropeway.